At 5.12 am on April 18, 1906, residents of San Francisco were jolted out of their sleep. Stumbling from their beds, many were unable to stand as the floor and their buildings shook violently. The quake lasted only a minute but caused one of the most devastating disasters in US history. Fires raged in San Francisco three days after the earthquake. As water mains were also broken, the city fire department had few resources with which to fight the fires. Several fires in the downtown area merged to become one giant inferno. More than 3,000 people were killed and 225,000 of the city’s 400,000 residents were left homeless. When the fires were finally out, more than 28,000 buildings had been destroyed. 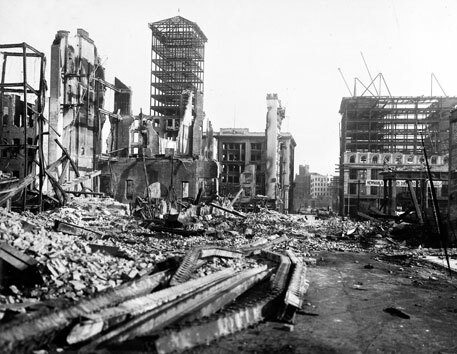 At the time of the quake, San Francisco was the wealthiest and most important city on the US’ Pacific Coast. It was a significant economic centre. Historical records show that the second half of the 19th century was a period of seismic activity in the area. Earthquakes seemed to be accepted as a nuisance but not something that would disturb the region’s daily life. Lawson had to correct himself when he was commissioned by California Governor—San Francisco is part of California—to head an eight-member team to investigate the San Francisco earthquake. The Lawson commission was relentless in systematically reporting data about the earthquake. They included over 300 photographs and numerous sketches capturing cracks on earth and damages to buildings. In addition to documenting the earthquake, the team conducted laboratory experiments and mathematical analyses to understand some puzzling observations. In the end, the commission’s thoughtful interpretation of data made the report a seminal piece of literature on earthquake. Its findings make up a two-volume tome, the largest set of seismic effects ever compiled in a single report. Lawson’s team covered hundreds of kilometres on foot and horseback, often through hills covered in poison oak. No detail was too small. Since early seismo-meters were unable to register the strength of such a powerful quake, the scientists interviewed witnesses, examined damages to buildings, took stock of landslides and trees that snapped and collected evidence of ground cracking. Scientists then didn’t know much about plate tectonics, but the detailed information proved invaluable in understanding links between tectonics and earthquakes. The team’s investigations led them to California’s sleeping giant: the San Andreas Fault. Born 30 million years ago, the fault is the boundary between the Earth’s North American Plate to the east and the Pacific Plate to the west. The Pacific Plate is moving north, the North American is moving south, the rate of “creep” being about two inches every year. Sometimes the plates lock, allowing no room for further movement. The Earth, however, is a dynamic entity, which means the plates continue to shift producing incredible strain at the point where the plates have locked. An earthquake occurs when the strain reaches the breaking point, and the two plates lurch forward, often overlapping, releasing huge amounts of pent-up energy in the process. According to the Lawson Commission this is exactly what happened along 500 kilometres (km) of the 1,300 km San Andreas Fault on April 18, 1906. 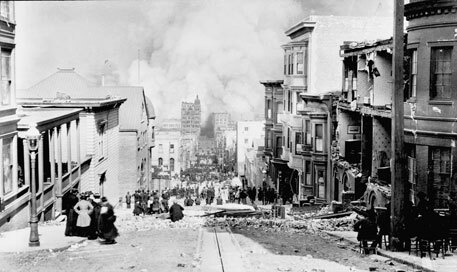 Techniques for measuring the intensity of quakes had not been invented by 1906, but scientists who studied the Lawson Commission report estimate the San Francisco earthquake at about 7.9 on the present Richter scale. The geologists also noted tiny ridges and valleys near the San Andreas Fault. One of them, G K Gilbert, noted, “The surface changes associated with earthquakes tended to increase the differentiation of lands into ridges and valleys.” Some of the ridges and valleys were products of the 1906 earthquake. But most were created during the earthquakes of the late 19th century which Lawson had dismissed as “nuisance” in his article in The Daily Californian in 1904. H H Reid who worked on the report’s second volume described how nearly half a decade of seismic activities had intensified strain, leading to the cataclysmic earthquake of 1906. This was another of Lawson Commission’s significant contribution: strain built up from earlier quakes can assume cataclysmic proportions. In the aftermath of the earthquake the damage it caused seemed another of nature’s caprice. But some buildings were virtually intact, while others were heavily damaged. The Lawson report and later studies showed that construction techniques, materials used and above all the makeup of the ground underneath had a big say in the destruction. During the California Gold Rush, parts of the San Francisco Bay had been filled in to create new real estate. Made up of loose earth, old timbers, rocks and other debris, this hodgepodge lacked cohesion and the strong temblors transformed it into a soft, unstable “pudding”, a process known to science as liquefaction. San Francisco’s City Hall, which was particularly hard hit, reduced to a ruin as the Greco-Roman columns that ringed the dome fell away with much of the masonry facade in a matter of seconds. The site had once been a marsh, the soft ground making any large building erected there vulnerable to a major earthquake. The greed of city officials and contractors during the nearly 30-year span of the building’s construction compounded the city’s woes. Shoddy materials were deliberately used. Old newspapers and trash had been incorporated into the building materials. Even before the great quake, City Hall’s internal sewage had seeped into its basement, collecting in a stinking pool of filth. The stench of sewage was the perfect metaphor for the stench of corruption seeping from behind the city’s handsome facade. The densely populated South Market area was also hit hard. Much of the site had been a marsh in the Gold Rush period. The four-story Valencia Hotel came to symbolise the disaster. Three stories had sunk into the marshy soil before the whole building collapsed on itself. Only the fourth storey, its walls crazily askew, remained above ground. Heroic rescue efforts managed to save about a dozen victims, but nearly 30 perished in the hotel. Many probably drowned, because a nearby water main had flooded the already mushy soil.